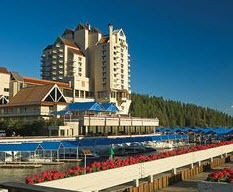 18 Jun COEUR D’ALENE RESORT & SPA STAY AND PLAY FOR $349! Golf Zoo is proud to announce our newest destination, the Coeur d’Alene Golf Resort and Spa! Coeur d’Alene is a perfect golf destination nestled in the mountains of Northern Idaho and should be on every golfers’ bucket list of courses!! Now is your chance to take some of your buddies pocket change on the world’s only floating putting green, the famous 14th par 3! In addition to world renowned golf and excellent opportunities to experience all the surrounding natural beauty, you will find yourself submerged in luxurious accommodations that are consistently rated a Top 100 Resort. This package is valid April 15th through June 30th, 2016. Contact a Coeur d’Alene Vacation Specialist for first-hand knowledge of the area & package details, or to get a customized trip itinerary!